ISO 13485:2003 is a globally recognized standard that specifies requirements for a quality management system where an organization needs to demonstrate its ability to provide medical devices and related services that consistently meet applicable customer and regulatory requirements. The primary objective of ISO 13485:2003 is to facilitate harmonized medical device regulatory requirements for quality management systems. 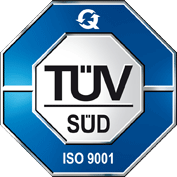 The ISO 9001:2000 standard shares significant overlap with 13485:2003 while including a focus on continuous improvement and customer satisfaction. Enzymatics Quality Management System encompasses the design, development, production, contract manufacture and distribution of molecular biology enzymes. Enzymatics is unlocking the potential of consumer genomics by delivering high value molecular biology enzymes to drive cutting edge nucleic acid detection technologies. The Company’s technical team continually applies its world-class skill in the development of biologics to produce a growing suite of enzymes manufactured to meet analytical specifications compliant to the ISO 13485:2003 and 9001:2000 standards. The company is privately held and Enzymatics products and services are available worldwide directly through the Beverly, MA office. Please visit www.enzymatics.com for more information on the company, products, and business strategy.